Just over a year ago I purchased a flat of butterfly garden plugs from the Ohio Prairie Nursery at the Midwest Native Plant Conference. 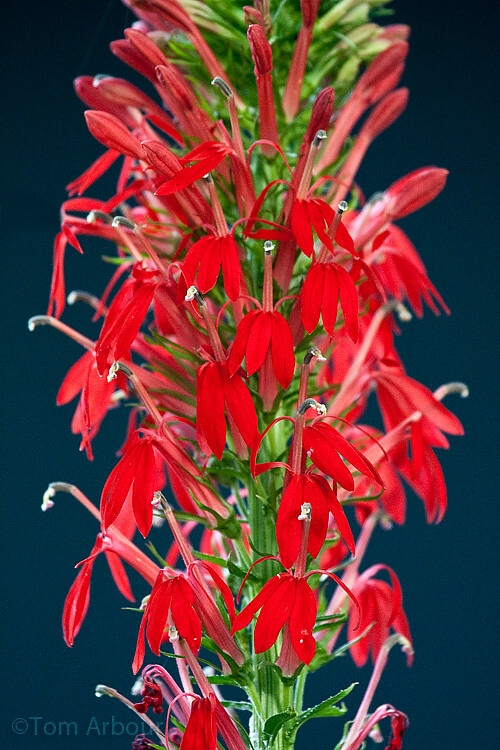 One plant in the flat was Lobelia cardinalis, or cardinal flower. This native Ohio plant is found in swamps and wet woods- it's just an amazing species, and I'm happy to have it in my yard. While photographing our backyard wrens, I noticed that I could photograph our cardinal flower against the navy blue background of my neighbor's shed- the deep reds and complementary blues made for quite a contrast. This upcoming weekend I'll be attending the Midwest Native Plant Conference once again on Sunday morning, and I'll be co-leading a field trip with keynote speaker Judy Semroc. I've had the fortune to be in the field with Judy at least a dozen times or so, and I can't wait to photograph the prairie forbs of the Darby Plains with her this Sunday. The blue background does this beautiful plant justice, excellent capture Tom!